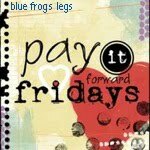 You guys know the drill...go out into the world and Pay it Forward, then come back here and share it with us :) And while you're at it, come on over to the Blue Frogs Legs Community, and join in on the discussions...Today we're talking about the good deeds we've observed other people doing. Because I believe the world is full of amazing people, and we should celebrate the amazing things that people are doing. Let's celebrate the positive stuff!!! *So I witnessed someone letting a stranger who had only a couple of items ahead of them in the grocery store line. *I witnessed a man running 2 blocks trying to catch up to a mom with two kids after she dropped one of their toys. *I witnessed people holding doors for others and generally courtesy. Wow! I wanna play on Friday! This is a great idea!